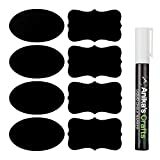 Anika 56 Chalkboard Labels - Stickers + White Liquid Chalk Marker - For Jars, Organization, Storage, Pantry - Oval & Fancy - 3.5" X 2"
So many girls have a ton of beautiful accessories, but don’t know how to organize them. A large portion of these accessories end up laying at the bottom of your so called “jewelry box” or hiding somewhere at the corner of the drawer and the only way that you’ll ever find them again will be to someday (when you finally decide to re-organize your room or move to somewhere else) discover them all over again. Here are some very useful and easy ways to organize your accessories. Not only they are better ways to organize, but also can be a way to display your jewelry as a piece of art on display as well. Click the ‘Next’ button to find out which display suits you the best!